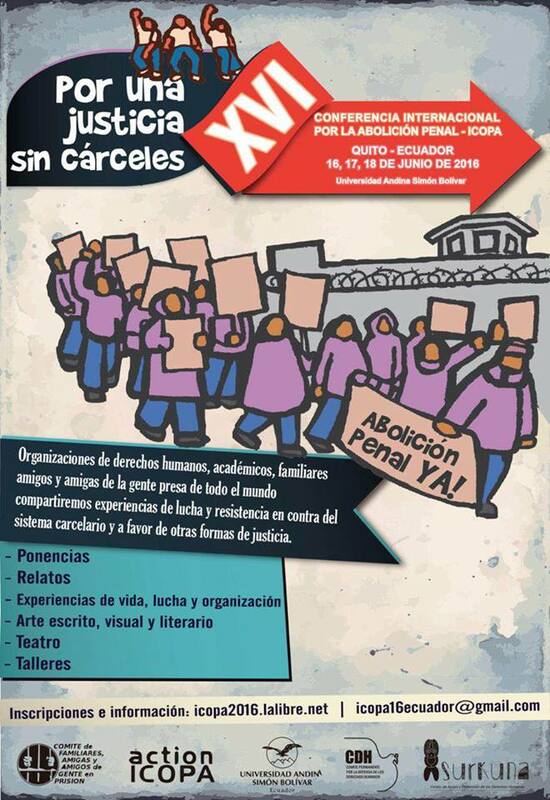 At the end of this week, the International Conference on Penal Abolition will convene in Quito, Ecuador. This semi-annual conference has pulled together abolitionists since 1983 to discuss practices and theories to dismantle the prison industrial complex. This continues to be an important space for Critical Resistance (CR) to learn about international abolitionist struggles and to build relationships with our comrades globally. Check out the video of interviews and footage prepared by CR at ICOPA 2013 in Ireland. CR staff and members will be discussing various campaigns and coalitional work, both as a part of a panel on San Francisco’s victory against new jail construction as well as in a presentation entitled “The War on Terror: Intensification of the prison industrial complex (PIC) through the logic of warfare.” The global War on Terror has had enormous and devastating impacts, not only on countries and communities who have been labeled and targeted as “terrorist” but on all people including those in the US who continue to face the violence of policing and imprisonment. In the wake of the tragedy in Orlando, these discussions feel ever important, as rather bolstering and resourcing community resilience, we see politicians supporting more militarized policing in the US, including heightened immigrant detention and deportation, as well as expanding imperialist warfare internationally. Critical Resistance positions our practice of abolition as confronting both the expanding prison and military industrial complexes, seeking to disrupt both interlocking systems through our work, such as our campaigns with coalitions fighting militarization of policing, solitary confinement and gang injunctions. While the state continues to further resource domestic and international warfare and target communities through fear mongering, imprisonment, policing, and surveillance, we will continue to resist and stand with all who are fighting the division, isolation, and repression of state violence. We look forward to using the space of ICOPA to learn about and share practical strategies for abolition, bringing international struggles back to our US context.